From a young age I loved shopping, I used to go every weekend after being paid from my waitressing/stables job and buy a new top, new dress or item to add to my expanding wardrobe. 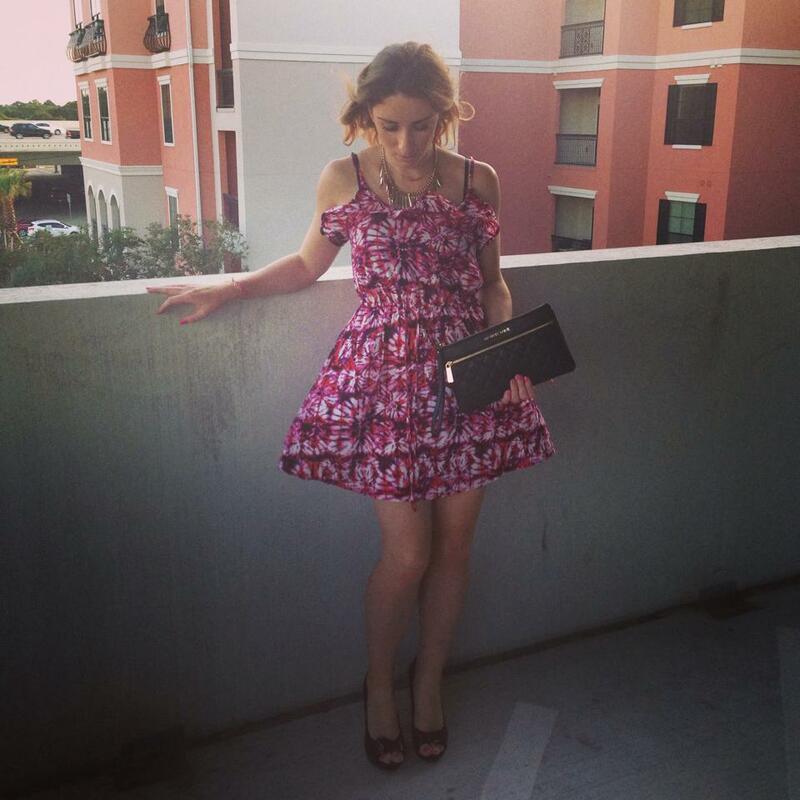 However, I used to buy a mishmash of items which by the time an occasion arose, or night out I wouldn’t have anything to wear because nothing would go together. I think it has taken a lot of purchases and a number of years before I have got to the stage I’m in now. I know my shape (unfortunately..!) I know what I like and I think I know what suits me (don’t get me wrong some days even my savior LBD can’t save me!) I’ve learnt you need to shop more smartly. This simply means not just buying items on spur of the moment, you need to think them through, match them with at least 4 or 5 other outfits to ensure they will be a good match in your wardrobe. This has saved me from making stupid buying decisions I’ve been rather strict on myself (not a bad thing for my bank balance). For my birthday very kindly my husband took me to an outlet mall and gave me a budget. I will go through the items I bought to show you it’s easy to spend your money wisely on items you will use time and time again opposed to ones that will sit in your wardrobe for years without even a little cinema outing! Hopefully this will help in future.. I have also stated the prices to show you don’t need to spend thousands to buy good quality brands – AKA this weekend get yourself to your nearest outlet!! Sneakers – Firstly, a more mature thought process for these bad boys! Since I’ve moved, I’m either in work gear or gym gear. I’m trying to find a way to create another casual/smart work/life balance as when you’re running about it’s impossible to do this in heels and frankly I just don’t really like pumps. Therefore I feel I may have a little love crush on sneakers! They are practicable, will last for ages and can be paired up with a range of different outfits comfortably while still looking flash! 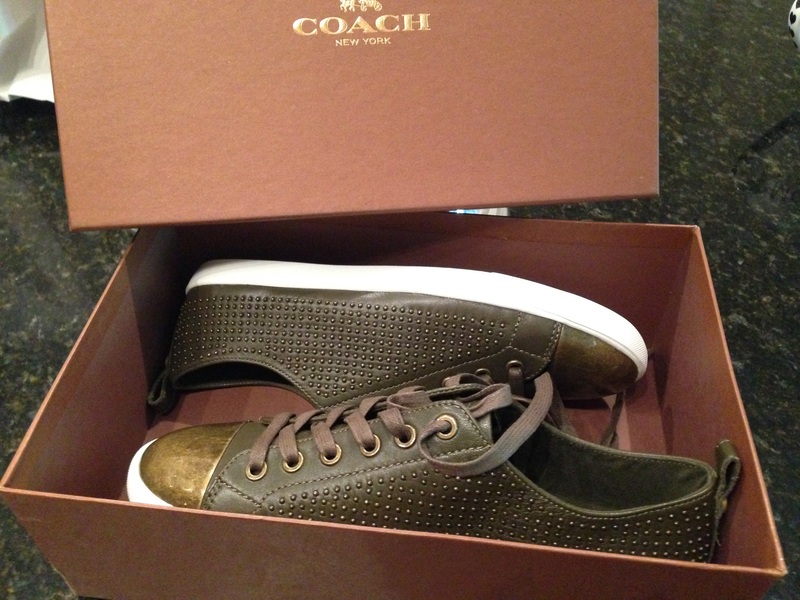 These are by Coach, cost around $100 from $180, colors match the khaki, mustard, jeans, black, oranges and pinks that I already have. They look immense! 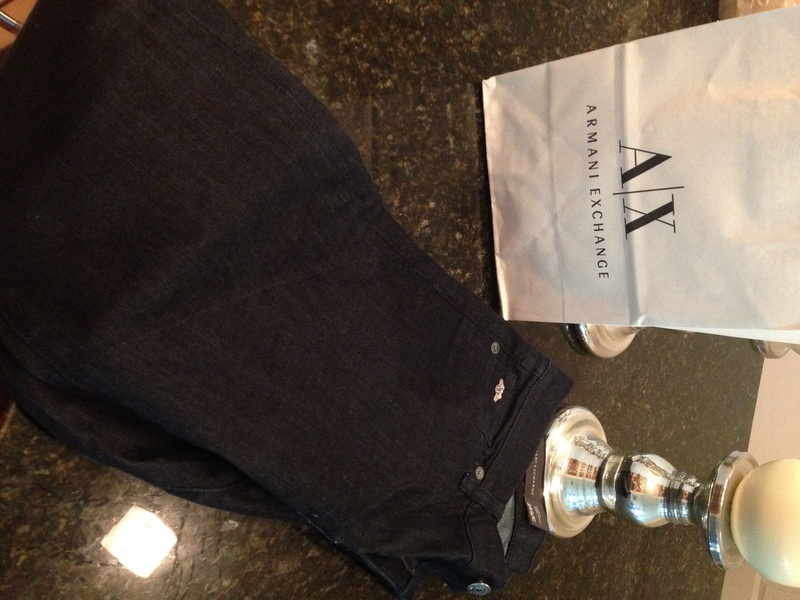 Jeans – I’ve already expressed my love for my new Armani jeans, which would have cost $98 I bagged them for $35. They fit beautifully, skinny style which means I can wear with boots, sandals, pumps, sneakers, and can be paired with a range of tops and jackets. Every girl needs that magic pair of jeans. Cute Tops – Banana republic do the most gorgeous tops which can be work out, to work, casually. Therefore I wanted to pick tops where just by matching up with different materials or items could be diverse. These both are. 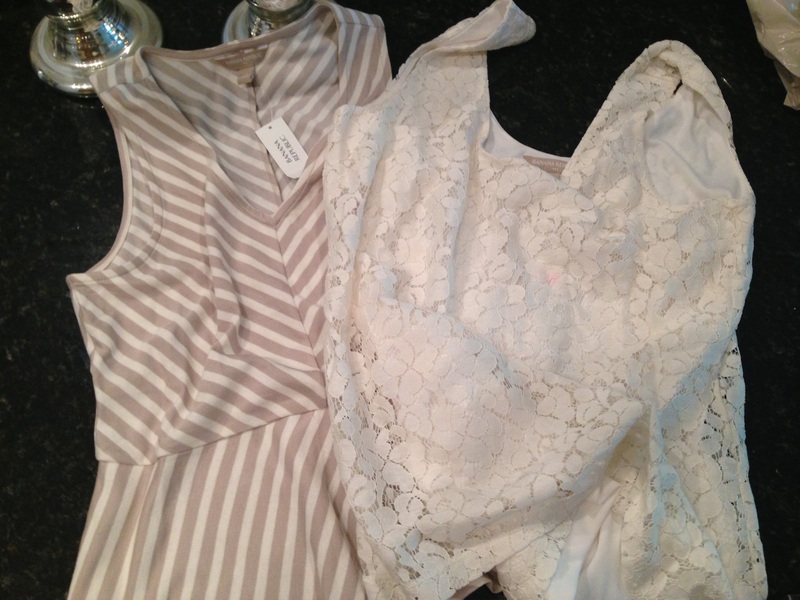 Both these tops were around $20 – half price. Classic Calvin Klein – Dare I say no more. 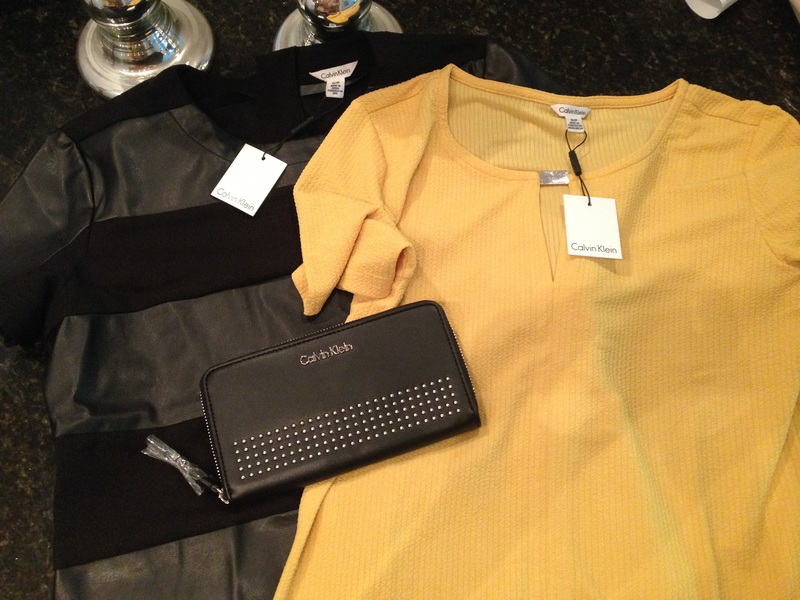 In general ladies you need items by CK in your life! I purchased a small studded clutch which is timeless, classic and will go with any outfit. From $98 down to $30. Two tops, mustard color will go with my khaki pants, jeans can be worn for all occasions and then the leather top which again can be dressed up or down accessorized with statement necklaces or enough on its own with the leather detail. As explained above it’s good to have a range of different tops but they need to be diverse enough to wear within your life schedule. Both tops were around $25 – more than half price off. The classic Maxi – As I’m quite short I’m not that much of a lover of maxi dresses, I love jumpsuits as they suit me better and I feel more comfortable and structured in them. 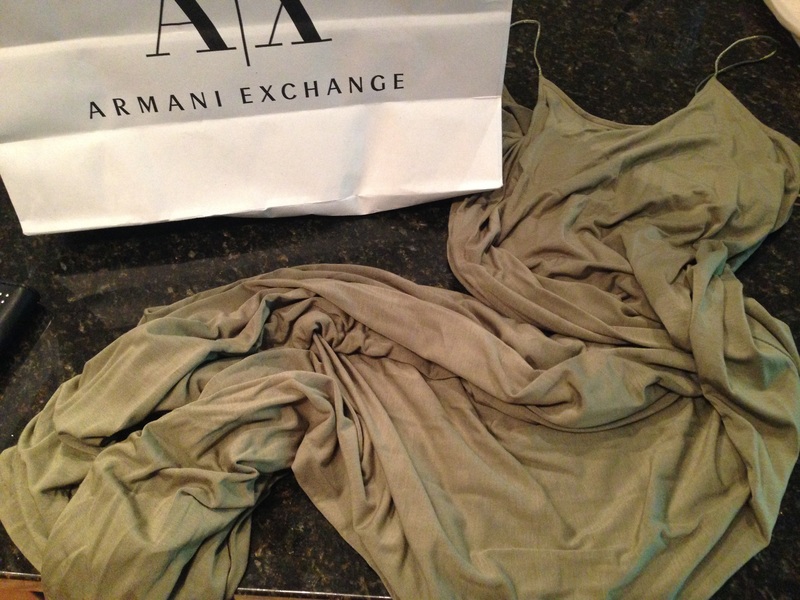 Until I saw this beautiful simple classy maxi dress in Armani. It was originally $109 however I purchased it for $25. It’s khaki color, which can be paired up with my orange jacket, lace white jacket, white blazers, black jackets or accessorized with gold or silver accessories. Perfect addition to my wardrobe. I also purchased my fail safe gym gear as it’s been so long since I bought any and I’m really trying to find the motivation before the Texan 20lbs becomes a reality.. if not more! I usually go for blacks and pinks. Tell me the last 4 purchases you have made and why…!! Hopefully after reading this and seeing the pictures, the colors all going together you can think smarter when shopping for your wardrobe. Previous Entry Pants Kinda Week..!